After an unexpected guest from the future, Nora West-Allen, appears at their home, Barry and Iris must figure out how to get her back to the future without disrupting the timeline…even more than she already has. Team Flash must work together to send Nora back, while simultaneously fighting off another villainous meta. 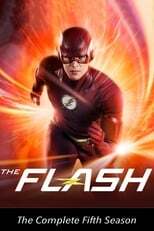 As Barry helps his daughter, Nora, become a better speedster, he and Team Flash also track down a meta stealing high-tech weapons, only to cross paths with a new foe named Cicada, who is hunting the very same meta with nefarious intent. After Cicada's attack on The Flash, the team realizes they need to think outside the box to stop this dangerous new foe. Desperate to help her parents, Nora comes up with a plan that ultimately puts a member of Team Flash in danger. Meanwhile, Caitlin delves into her past. Barry and Iris face the ultimate parenting test when Team Flash battles Spin, a savvy millennial armed with meta tech, and a dangerous agenda for their daughter, Nora. Ralph is feeling defeated until an unlikely source issues a challenge to help boost his confidence. Nora lets something slip about the future that devastates Iris. In an attempt to distract his wife, Barry asks Iris to team up to stop a new meta, Rag Doll. Meanwhile, Caitlin learns something about her father. Caitlin, Barry and Cisco learn something new about Caitlin’s father. Meanwhile, Iris and Sherloque follow a clue about Cicada. While Nora grapples with unresolved anger over her father’s disappearance in the future, Barry and Team Flash must stop a powerful new meta, Weather Witch, from killing her own father, Weather Wizard. Barry and Team Flash come up with a plan to stop Cicada. However, the plan calls for Barry and Nora to travel back in time to gather some key necessities. However, Barry hesitates, concerned about his daughter seeing certain parts of his life. Meanwhile, Sherloque takes his concerns about Nora to Iris, and Caitlin turns up a key asset in the fight against Cicada. During a battle with Cicada, Nora is severely injured. Due to Cicada's dampening powers, Nora's speed healing isn't working, leaving Barry and Iris scared for their daughter's future. Upset about his injured child, The Flash is filled with rage and confronts Cicada in a brutal battle. Meanwhile, Killer Frost keeps interfering with Caitlin's work on the cure. When Sherloque wants to use a memory machine on Barry and Nora to help gain access to Grace's memories, Nora panics, fearing her parents will find out the secrets she's been keeping from them. Nora secretly decides to use the machine on her own which ends in disaster after she gets trapped inside Grace's mind. Barry and Iris go in after their daughter and Iris is brokenhearted by what she finds. Meanwhile, Ralph tricks Cisco into going out for a night out on the town. Barry and Ralph must go undercover as criminals in an illegal black market to purchase a device that could help them stop Cicada. Once inside, Barry and Ralph find their morality tested as they slip deeper into the criminal world, eventually having to choose between committing a crime, or losing the means to defeat one of their greatest foes. Meanwhile, Iris investigates a lead on Cicada's whereabouts and ends up in a dangerous situation. After Iris lands in serious danger, Nora races to save her mother. Barry puts the finishing touches on the metahuman cure, leaving Cisco with a rare night off so he decides to take Kamilla on a date. When Gorilla Grodd attacks Central City, Barry and Team Flash find themselves teaming up with an unexpected ally to defeat – King Shark. However, when they hit a snag, they bring in Dr. Tanya Lamden to try to reach the man behind the shark, Shay Lamden. With the meta-human cure ready to use, Barry and Team Flash must figure out a way to subdue Cicada long enough to take it. Killer Frost steps in to help with the plan. Meanwhile, Joe eases back into work, and Nora isn’t happy about the way her dad plans to stop Cicada. Team Flash finds out that a suburban mom named Vickie Bolen is in danger and they race to save her. Upon meeting her, they discover she’s a meta-human who is hiding her abilities from her family. Barry encourages Vickie to share her secret with her family, which makes Nora realize she needs to come clean with her parents about Thawne. Barry continues to struggle with how he feels about Nora's betrayal. Brie Larvan, Joss Jackam and Peter Merkel return to Central City. Meanwhile, Cisco makes a bold decision. Team Flash is on high alert after Cicada II threatens to unleash a dangerous virus that would put all meta-humans at risk.